Visiting Indian Home Minister Rajnath Singh on Saturday said he had an “extremely fruitful” meeting with Prime Minister Sheikh Hasina. “Had an extremely fruitful meeting with the Prime Minister of Bangladesh, H.E. Sheikh Hasina in Dhaka today. We discussed a range of bilateral and regional issues of mutual interest,” he said in a tweet. The Indian minister said the processing of visa applications for Bangladeshi applicants will be simplified through opening of the state-of-the-art Indian Visa Application Centre (IVAC) in the city. “With the opening of this Centre, the processing of visa applications will be simplified,” he tweeted after inaugurating the largest ever Indian visa centre in Bangladesh jointly with his Bangladesh counterpart Asaduzzaman Khan. The Indian High Commission in Dhaka issued 14 lakh visas last year. It issued 9.76 lakh visas in 2016 and today Bangladeshi people constitute the largest number of visitors to India. The new integrated visa centre, with all the facilities in place, will issue 5000 visas on average every day and the visa applicants will be treated as guests. On Friday, Rajnath Sing said Bangladesh and India have made notable progress in transforming land and maritime boundaries into zones of peace and tranquility. He said India is looking forward to strengthening the bilateral relations between the two countries on the basis of friendship and trust. Upon arrival on his three-day official visit on Friday evening, the Indian minister also said the relationship between Bangladesh and India is anchored in history, culture, language and shared values of democracy. “India attaches great significance to ties with Bangladesh,” he said in a tweet. 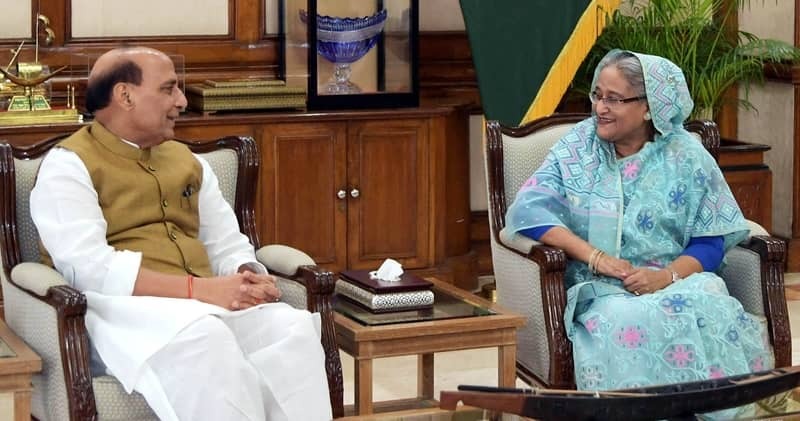 Bangladesh Home Minister Asaduzzaman Khan and his Indian counterpart Rajnath will co-chair the 6th meeting of the Bangladesh-India Home Minister level talks at the Home Ministry that will begin at 10:30am on Sunday at the Home Ministry in Dhaka. The ministers are expected to discuss issues related to security, border management, cooperation in countering illegal activities and travel arrangements, officials said.